After a long summer of iced coffees and frozen fruit drinks, we can finally enjoy hot and savory soups. Fall brings back cozy nights with a comfy blanket, a good book, and a steaming bowl of soup. The first soup of the season is Butternut Squash Soup – so easy to make and so overwhelmingly…orange. Cut the squash into small cubes and sauté until brown. In another pot add chopped onions, cook until soft – add curry, ginger, and olive oil, and warm for a minute. Then add the cubed squash bits and simmer for 40 minutes (add water or chicken broth for a liquid base). Once the squash is mushy and tender – purée in a blender. Serve with a dollop of sour cream, chopped cilantro. 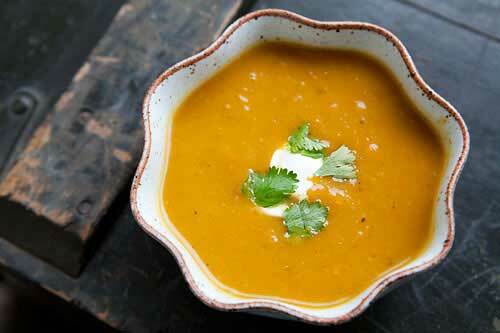 For more details and portion sizes visit Simply Recipes – Curried Squash Soup.